Circuit board assembly is a proven engineered process. Therefore, developing a consistent process for quoting this service is the first step to insuring success. Following some simple guidelines can lead to more accurate quotes in less time. This is a win-win for any contract manufacturer and customer relationship. Because the completed quote serves as the basis for assembly, initial accuracy is important. 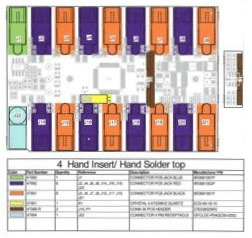 Start with a clear understanding of the documentation required to build any printed circuit board assembly. It also helps to know whether an overseas bare board supplier can be used, if the assembly has any custom parts, and whether programming or coating is required. The contract manufacturer must know upfront whether the circuit board assembly needs to be RoHS compliant (lead-free) or not. The parts and assembly process differ greatly based on the answer to this question. Adhering to the customer specifications is typically the default of any contract manufacturer. Knowing if you are authorized to substitute passive parts or even suggest part substitutions at all is important. How Should the Data Be Filed? Storing documents in a consistent manner serves manufacturing and the customer at the same time. Cutting corners or guessing about the requirements of the project often lead to mistakes. Quality is number one from anyone’s point of view. Notifying the assigned quotation personnel about a new request for proposal, and providing an active link to the project folder will ensure that efforts are not duplicated. The information needed to generate the labor and material cost estimates is now at the fingertips of the people who are responsible for the quote. Addressing open issues will keep you on task. Living with unanswered questions can lead to assumptions that could affect quality, or cause the contract manufacturer to miss the targets set during the quotation phase. These actions have a direct effect on customer satisfaction and bottom line profits. Including an attachment that lists the quoted lead time of each part on the bill of material, any minimum purchase requirements, and special notes that apply helps to keep the buyer fully informed. Going the extra mile when developing a written proposal could mean the difference between winning or losing an opportunity. 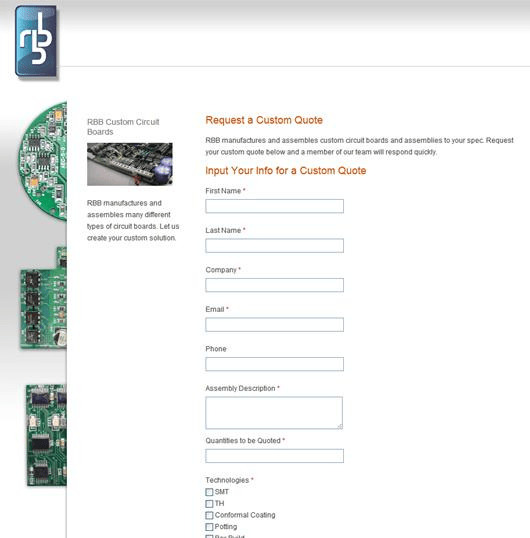 At RBB, we manufacture and assemble custom circuit boards and assemblies to your specifications. Click here to request your custom quote today.